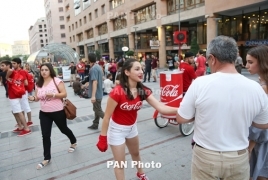 PanARMENIAN.Net - Coca-Cola Hellenic Armenia celebrates summer, organizing special festivities in different corners of Yerevan, helping to fight the heat with a cold can of the world-famous soft drink. From August 5, Coca-Cola giveaways and dancing celebrations are being organized in the capital. During this period, in the most crowded corners of our city passers-by can watch modern dance performances and enjoy the refreshing Coca-Cola in a handy slim can. This new pack introduced in our country just recently by Coca-Cola Hellenic Armenia, is designed specifically for drinking on-the-go. “We greatly value preferences of our consumers and always consider them when expanding our portfolio. The 250 ml slim can enables our consumers to get their favorite drink in a handy packaging and at quite an affordable price. We believe it will particularly suit our younger - dynamic and active - consumers, who can now more conveniently enjoy their favorite drink on the go,” Sayyora Ayupova, General Manager of Coca-Cola Hellenic Armenia, said. The Company will continue spreading the festive mood and celebrating the end of the holiday season with a refreshing slim can of Coke until September 2. Coca-Cola Hellenic Armenia is a subsidiary of Coca-Cola Hellenic Company. It has been operating in Armenia since 1996, being the only authorized bottler of Coca-Cola products in the country. The Company’s beverage portfolio includes Coca-Cola, Coca-Cola Zero, Fanta, Sprite, BonAqua, Burn, Powerade, as well as Nestea, Dobriy, Rich and Schweppes. Coca-Cola Hellenic is one of the world’s largest Coca-Cola bottlers. The group operates 68 factories in a total of 28 countries worldwide, serving more than 593 million people overall. The Company has been for years included in the Dow Jones Sustainability Index. In 2015 the company was recognized as the best in beverage industry in Europe and the world, maintaining its leading position for two years.